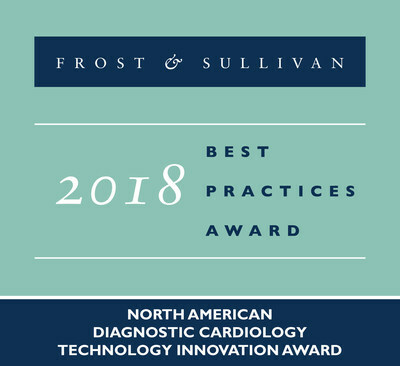 SANTA CLARA, California, Nov. 1, 2018 /PRNewswire/ -- Based on its recent analysis of the North America diagnostic cardiology market, Frost & Sullivan recognizes Welch Allyn, a subsidiary of Hill-Rom, with the 2018 North America Technology Innovation Award for its industry-leading and clinically validated cardiology solutions. The company's innovative diagnostic algorithms, electronic medical record (EMR) connectivity and integration, and enhanced security features offer unparalleled client value, innovation, and ease of use. With the 2017 acquisition of Mortara Instrument, a leading diagnostic cardiology and patient monitoring technology provider, the company gained the capabilities to help clinicians further reduce the number of steps it takes to perform an electrocardiogram (ECG), helping to increase accuracy and workflow integration. "In 2017, Welch Allyn launched the Connex ® Cardio ECG, the company's first cardiology product introduction since the Mortara acquisition. The Connex Cardio ECG is a 12-lead ECG that combines the VERITAS ® algorithm with wireless technology and flexible EMR connectivity to capture ECGs," said Patrick Riley, Principal Consultant at Frost & Sullivan. "The VERITAS algorithmâ€”the same one used by the FDA to evaluate drug safety in clinical trialsâ€”analyzes and interprets the ECG reading, and the system then prints, stores, and transmits the results to the EMR. The resulting ECG can simplify clinicians' decision-making and workflows in one of the most commonly performed tests they do in the office every day." The Connex Cardio ECG can offer such superior and wireless ECG capture by employing the unique WAMâ„¢ Wireless Acquisition Module. The system is highly scalable yet simple and can launch directly from the EMR to acquire ECGs in real time. Regional health systems have already started standardizing their devices with the Connex Cardio ECG, and on the back of this success, Welch Allyn is preparing for global distribution. "Welch Allyn has cutting-edge data security, which is a powerful purchase influencer among increasingly security-conscious customers. Data is translated and transported to diverse software systems and formats via DICOM ® and Health Level Seven International communication standards," noted Riley. "The company's breadth of connectivity is an equally strong value proposition, as it allows devices to work with multiple systems in the hospital and beyond." Each year, Frost & Sullivan presents this award to the company that develops a product with innovative features and functionality that is gaining rapid acceptance in the market. The award recognizes the quality of the solution and the customer value enhancements it enables.